One of our younger employees had to create a presentation about a subject near and dear to the company I work for. By the way, I noticed that I had neglected to migrate the “About Me” widget when I moved this blog to WordPress. I’ve corrected that, but for those that don’t know, I am VP Information Services at American Nuclear Insurers (yeah, the IT Guy). Anyway, the subject of the presentation was Three Mile Island and he had seen a few presentations by others in our company on that subject so he wanted to build on that good work. That good work was mainly completed before we installed SharePoint. He’s a nice guy, and several of us wanted to help. My contribution was to search the K: Drive for ‘*.ppt* – Don’t try this in your organization. I found several examples of the content my colleague was looking for. Along the way, I found other good presentations that I can’t remember seeing before. I made a few notes and I started thinking about a plan to recover those. I also found some curious stuff that made me laugh. I thought I’d share these given that it’s a holiday weekend here in the States and who wants to really think hard about SharePoint. Note to my coworkers: These were all created by former employees. This truly was a bad slide. This was a slide I would never want to see in a presentation. Why somebody thought to save this bad slide is beyond me. Maybe they felt we needed an example of what not to do. We have tons of these. Most of them are what you might expect, the first few moments of a presentation’s life that got trapped in amber when someone popped in and said “you want to go grab lunch?” You know what happens next. You hit the ‘X’ – the warning appears – you think “I don’t want to think about this now” and you press the ‘Save’ button. This has nothing to do with blast, blasting, blasted or Three Mile Island. Also, there’s no apparent reason why this might be the 29th in a series. I like this. This would be a great name for a template. “Here’s your next presentation.” Is that what someone was thinking? Uh, no. Male readers will understand why I didn’t want to open this presentation. Fortunately, it wasn’t named for medical reasons. Curiously, I couldn’t see why anyone picked the letters ‘PSA’ to describe the content. Like I said earlier, we have tons of these. This presentation was actually holding the photos for Appendix A of something, although it isn’t clear what body the appendix belonged to. The .ppt extension helps explain, because I think that was from the time before Office applications were capable of adequately handling graphics. Power Point was always pretty good with graphics so it was often used as a storage mechanism for pictures. Not sure why we needed more than one copy though. My best guess is that the owner of this presentation was experimenting with different themes. Maybe 6 was the magic number (no evidence of testPresentaions 1 through 5). Again in fairness, I don’t know when PowerPoint began supporting multiple themes within the same presentation so maybe this was just the way things had to be. I also don’t know why anyone thought they should keep this. No clue as to what Part-1 was, the subject was hinted at but the single slide in this presentation didn’t appear to be an opening slide, at least not a good opening slide. This might be an indication of early collaboration. Although they weren’t found in the same directory, the content of Title.ppt and Part2.open.ppt, combined with my knowledge of the owners lead me to believe that these were two people who were working on the same subject. This might be my fault. In the era of departmental share drives, only employees of a given department had access. There was a common share drive, but it quickly became a digital landfill and couldn’t effectively be used for collaboration. These nascent bits of a collaborative presentation would have been combined later via 10 or 20 emails. OK, this one’s on me. This is offered just to prove that it isn’t just my former coworkers who were periodically challenged to effectively use one of the few bits of metadata actually available at the time. We received this presentation from a foreign reinsurer. Offered as evidence as to why we need things like SharePoint. I wish my readers in the US a happy Memorial Day. I hope everyone reading this has a great weekend, and if you ever served in the military in the defense of freedom, Thank You! Good Question, the Answer is Yes! After some fairly extensive proof-of-concept work, I had the opportunity to meet with some of our engineers this week to review our plans for the “system” of SharePoint lists, libraries, interconnecting metadata and workflows required to track the recommendations the engineers make as a result of their inspections. Wow, was that really one sentence? Sorry. Everything that I took to the meeting was wired together to support a smooth flowing business process. Of course, this was a review with the end-users, the people who know how that smooth process goes off the rails. As I worked my way through the process flow I described last week, a question emerged. I had described how, in order to avoid processing a recommendation, only to have it be removed after review, the main workflow wouldn’t run until the report status was final. They pointed out that while that was logical most of the time, during the group review meeting they need to review all recommendations, including the ones that are “about to be released.” No problem, the workflow can be started manually. Also, we will add another little bit of metadata to prevent duplicate updates from occurring when the report gets released. We spent a good deal of time reviewing the way the workflow was processing the text of the Word document. “What if the order (New, Pending, Open, Closed) was mixed up?” “What if we refer to a recommendation inside the text of another recommendation?” “What if the status e.g. ‘pending’ is used in the body of the recommendation?” All good questions, but none of them are show stoppers. I had been tipped off to the fact that the various status states could appear in any order. The good thing about processing text with the aid of a Regular Expression is that I don’t need to care where the text is. Also, the format of these reports allows me to distinguish between “Pending” as a section header and “pending” as in “the reason this recommendation is still pending…” Same with the recommendation numbers, HarePoint’s workflow extensions lets me distinguish between a number used as a title and the same number used in text. There’s no magic here, when these strings are used as headers, they are either preceded or followed by CR/LF combinations. SharePoint “systems” are still in SharePoint. In other words, everything that the workflow is doing can be done (or undone) by humans. Engineers love hearing that. They love knowing that there is a ‘manual override’ or a way to start, stop and derail a process without having to call the IT Guy. Of course, I mentioned that while phone calls would require a manual entry, we could easily apply a similar workflow to an email-enabled library. In that case, the engineer could simply CC SharePoint and let the automation happen. We opted not to add that feature, but it’s always nice letting people know that SharePoint is prepared to go even further. They opted for the third choice. They wanted a visible trail to indicate the activity. I pointed out that we could build columns into the item so each item could store before and after versions of the metadata, but that seemed messy. Given the choices that they made, it will be pretty easy to prepare a composite view of the proposed items and the approved items that will provide a chronology of what took place. We won’t be recording the conversation, but we will be documenting the results. The really cool part of this conversation was that, with the exception of a few tricky bits from HarePoint, this can all be brought to our engineers courtesy of out-of-the-box SharePoint. Microsoft baked some serious power into this product. The world of information management is only rarely marked by feel-good moments so when one happens, you have to talk about it. My moment starts in in the office of my alter ego. You see, in a small company, everyone wears multiple hats. One of my hats is the dreaded administration budget. I pay the rent, I make sure the plants are watered and I buy the postage. Actually someone else does most of the work; I just approve the orders and payments. 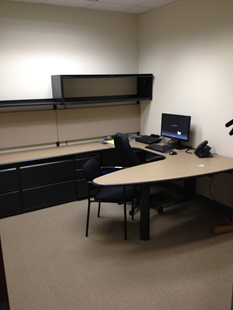 This budget includes furniture and fixtures, so when one of our employees wanted the “system furniture” in his office reconfigured, he had to work with me. Anybody associated with information management would have felt exactly the way I did when he said that, I would have moved that furniture myself. Sure, it’s only one guy, and he’s a relative new hire. He doesn’t have years’ worth of legacy paper to deal with, but I’m just happy that he doesn’t want to start his collection. We have done a couple of small projects in SharePoint for him, but one that we have been working on recently is a very cool use of SharePoint. A new item is created in a SharePoint Library from one of several Excel spreadsheets that are templates for the Content Types related to the business we quote. A SharePoint Designer workflow picks up the metadata, reads values out of the spreadsheet and creates an email to the person requesting the quote. The body of the email contains other information from the spreadsheet. Additional metadata is updated to indicate the status of the quote. SharePoint can benefit everybody in an organization and the people supporting SharePoint should be willing to work with anyone who has a requirement. SharePoint can and should be mapped to a business process in a way that adds value to that process or reduces the work involved in that process. Handling the business process as well as the information management associated with it is a good way to add enough value to justify handling a small need. It’s a bundle, just like the ones the cable companies offer. SharePoint isn’t an independent technology. Whether you are adding custom code to a SharePoint page, bolting on a third-party product or using some behind the scenes tool like we are, SharePoint can be made to work the way Microsoft imagined. SharePoint is one of the tools available to us. Combining it with the other tools can result in some pretty cool solutions. This started out to be a few thoughts on records retention. Why we need to embrace the subject everyone wants to ignore. Don’t get me wrong, everyone thinks life would be better if we were operating under a grand all-encompassing records retention policy, but nobody, NO-Body wants to write that policy, nobody. I thought I’d take a stab at advocating the effort, but some of my reasons really didn’t support my argument, so I guess I’m just collecting random thoughts today. I wanted to address records retention for personal, selfish reasons. In the absence of comprehensive records retention policies, content management solutions are harder to build, more complicated to implement and less effective. In my experience, building a records library in SharePoint is a straightforward task. When you’re dealing with records, the thought has already been added. You probably know all of the metadata, and if you know how long to keep the records, you simply need to decide what happens on day n+1 and implement that in your configuration. SharePoint can accommodate most anything you want to do, including nothing. Backfilling a records library with things that are already considered company records is also easy. It might be a time-consuming task but it’s not a difficult task. Again, that’s because we already know that the documents are records and we probably already have the information we need to set those metadata fields. In a conversation this week, I pointed out that we could easily build a library for a bunch of content someone has decided to keep as records. We can configure the library to accept notes, documents, email and hard copy. Email can be dragged in from Outlook via Harmon.ie, notes can be uploaded as Word Documents or typed in place and we can now scan documents directly into SharePoint – Easy! Of course, there was no definitive answer. In this case, the lack of a begin-point on the continuum isn’t a problem. Every bit of content that will end up in this library will be processed the same way. I am going to wire up a few connections, write a few procedures, demonstrate a few actions and be done. If this library was like others that we have been building, the lack of that begin-point would cause us more work. When you’re working with content that is going into a workflow driven process, maybe something that’s generating statistics and driving a dashboard, you have to decide what content will be processed as if it is current and what content just needs to look like it’s always been here. We have one such system, and in order to keep backfilling operations from skewing the metrics, we had to build a separate workflow driven process to support the induction of prior documents. If we don’t get an answer to that question, things get even more complicated. Consider the implementation of a new document management solution in SharePoint. In the worst out-of-the-box scenario possible, you point your users to a team site complete with the picture of the happy looking, albeit creepy people in the upper right corner. All of the documents that used to be in the K: drive, are in the Shared Documents library complete with the historic folder structure. You tell yourself that the folder structure is a kind of metadata (it is, we’ve done this). As bad as a site like this would be, it could be worse if you fail to consider that starting point. Your solution begins with those documents that were on the K: drive, but what about the documents that are still in file cabinets. What about the stuff on microfilm/fiche. Your users probably have copies of those documents on the C: drives and in their inboxes. In this scenario, what do you tell the new guy when he asks “how do I find everything about the accounts I’ve been assigned?” How do you rewrite procedures? 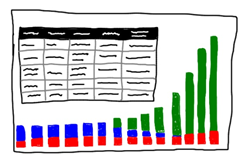 How do you document the business process you just spent money (remember, time is money) building? In my recent conversations, some people felt that we would still be ahead of the curve if we have some of our content in SharePoint? I disagree. We can’t put our arms around the body of content we might be asked to provide. We won’t have reliable search results, and we won’t have be able to say, with authority “I’m sorry, we don’t have that document.” Just so you know, you want to be able to speak with authority when an auditor or a judge asks. Content management has to include all the content we still feel is relevant, the content we are told by authorities we have to consider relevant and the content that still adds value to our business operation. Effective content management shouldn’t include anything else. The word of the day is ‘Find” as in the word is not ‘search’ – people don’t (really) want to search, they want to find. That was the message offered up by Steve Weissman in our recent training sessions, and that was the message offered up by Bob Larrivee when I attended his AIIM ECM Master class several years ago. In fact, Bob was the first person I ever heard use the word “findability” in a sentence. Bob and Steve are correct, people want to find stuff. I might like to replace “Search” in SharePoint with “Find” just for that reason. I’m sure there are people who would tell me how to do that, “it’s just CSS” or “it’s just a bit of script” or “it’s just tweaking the master page” but I won’t really do it. I won’t do it because we are conditioned to search. I’m not sure if that is Google’s fault, or Yahoo’s fault, perhaps it’s AOL’s fault, but ‘search’ rules and ‘find’ lags pretty far behind, even when we search. Despite that fact, finding is the goal. The problem with search is, well there are too many problems with search to talk about in one blog post, so let’s talk about find instead. How do we find what we are looking for in SharePoint? Those attributes all help to make it easy to find what we are looking for. We know what stuff is – We have lots of content in our company, but we have a relatively small number of types of content. Some of those types are generic: presentations, correspondence, contact lists, etc. and some of those things are unique to our business (or at least to insurance) like inspection reports. SharePoint supports both types of content, but it takes more effort to support the unique content. However, the results often make the effort worthwhile. In reality, a loss-control inspection report is just a Word document but if I am looking for one, my results are much better if restrict my view (or my search) to a specific Content Type than if I include all Word, or worse all Office documents. How many recommendations have we made at this place? Was this recommendation accepted, rejected, explained away or ignored? How many times have we made recommendations similar to this one at other plants? Of course, with the right metadata and enough clicking, people could probably configure a list to answer some of those questions while they are looking at it. With a little more time, they could build a View to preserve those settings, but very often, that isn’t enough. In my example, we let them click on certain attributes in one list and then we present them with a page of web parts showing a composite picture from several lists – lists that are linked by metadata – so they can find the rolls and the pickles easily. Search is a native element of SharePoint. With metadata and text indexing, we can make search return more and perhaps better results. By thinking about where we put our content, what our content is and how people will want to use it, we can use other features within SharePoint to help people find what they are looking for.